Pittsburgh Post-Gazette - Who Killed Westinghouse? - In the beginning. 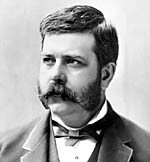 . .
George Westinghouse already sported his signature mutton chops in this 1884 photo. To live in Pittsburgh in the late 1800s was to have a front-row seat to the Industrial Revolution: it was a hotbed of capitalists, entrepreneurs and financiers, a potent brew of commerce and industry that makes today's Silicon Valley seem like some suburban outpost. The nation's brickmaking, coal, electrical, gas, glass, iron, locomotive assembly, oil, shipbuilding and steel industries all called Western Pennsylvania home. There were Andrew Carnegie's steel mills, Henry Clay Frick's coke ovens, Charles Hall's new aluminum company, and Henry John Heinz's food-processing company. They became U.S. Steel, Alcoa and H.J. Heinz Co., giants in their fields. Then there was George Westinghouse. The son of a New York agricultural machinery maker, the 21-year-old inventor came to Pittsburgh in 1868 in search of steel for a new tool he designed to guide derailed train cars back onto the track. Before he died 46 years later, he gave the world safer rail transportation, steam turbines, gas lighting and heating, and, of course, electricity. He founded not only namesakes Westinghouse Air Brake and Westinghouse Electric, but also Union Switch & Signal and the forerunners to Duquesne Light, Equitable Gas and Rockwell International. All the companies shared a common trait -- they made products that brought order to chaos. His air brake invention, for example, used compressed air to apply pressure simultaneously to rail cars, stopping a train quickly and evenly. Before Westinghouse's invention, brakemen tried to turn handwheels on individual cars at the same time, an imprecise, herky-jerky procedure that could take forever. He received three dozen patents for reduction valves, expansion pipes and other devices that could distribute natural gas safely from the ground to homes and factories. He would test his theories on a 300-foot natural gas well that he had drilled in his back yard in Homewood. It was his work harnessing natural gas that gave Westinghouse his ideas for his most significant breakthrough, the use of alternating current to transmit electricity. Westinghouse didn't invent alternating current; he acquired the patent rights from two European scientists. He had a knack for spotting good ideas and people and bringing them into his fold. And he knew AC was a good idea. At the time, direct current, or DC, was in favor. It was being promoted by inventor Thomas Edison, in no small part so that his Edison Electric Co. could supply the generators and distribution equipment. Edison's word was gold in the scientific and business community. But DC had a problem. The voltage -- the pressure that pushes electricity through a wire -- had to remain constant. That meant power stations would have to be built every mile or two, or wiring would have to be a foot thick to carry electricity long distances. Neither option was desirable or economical. AC, on the other hand, let the voltage vary, allowing it to be carried over far distances as long as the voltage could be raised or lowered as needed. That's where Westinghouse and his team of scientists focused their energies, inventing the transformer and other transmission and distribution devices that made electricity more economical and useful. Westinghouse formed his company, Westinghouse Electric Co., in 1886, the same year he showed off the promise of AC by lighting up the small New England village of Barrington, Mass., for two weeks. The experiment led to a slew of power plant orders. But Edison, who teamed with other electrical suppliers to found General Electric, didn't go down without a fight. GE executives fanned out through the country, warning about the dangers of the Westinghouse current. They said that AC couldn't be controlled, that it was a monster waiting to be loosed. To drive home their point, at the end of their speeches, they'd electrocute a dog or cat in electric chairs that they had dubbed "Westinghouse Chairs." It was the beginning of a rivalry that would last throughout Westinghouse's history, one that in latter years saw GE get the upper hand again and again. First Westinghouse Electric beat out GE for a contract to light up Chicago's World Fair in 1893, followed two years later by installation of hydropower AC generators at Niagara Falls, which not only supplied Niagara Falls but Buffalo, 22 miles away. AC's future was secure. He didn't smoke, drink or see doctors -- he just worked. Every day. He spent most of his time in the shop, his sleeves rolled up. About the only thing that slowed him down was his massive girth -- he loved good food. And his companies became major employers in the region, with Westinghouse Air Brake in Wilmerding and Westinghouse Electric in nearby East Pittsburgh expanding in opposite directions. It was often thought their facilities would some day meet. Despite the growth, by Wall Street's standards, George Westinghouse wasn't the best manager. Westinghouse Electric underwent a bankruptcy reorganization twice during his tenure, the second ending with his ouster as chairman in 1909. He took a leave but never came back. Instead, in 1910, he formed another concern targeting the automobile industry with his compressed air shock absorber. But Westinghouse's body couldn't hold up. He was ordered to take a rest in 1913 as a heart ailment flared up. He retreated to his estate in Lenox, Mass., where he would while away the morning hours fishing. On March 12, 1914, he died sitting in a chair in a New York hotel, the drawings of an electric wheelchair he was designing an arm's length away. In his lifetime, he received 361 patents for his inventions, and founded 60 companies. To critics who questioned his management acumen, George Westinghouse would say: "Look at all these jobs I created. Does that mean I'm a bad manager?"